Keeping your footwear and gear clean is more important than you realise. Not only does clean gear make you look and feel better but leaving footwear dirty can affect its breathability, which will hinder water-repellency as well as performance. Luckily Footwear + Gear cleaner is easy to use and will remove dirt and odours from all footwear and outdoor gear. It has multiple uses, which is why we love this handy bottle. Whether you have a jacket that needs to be spot-cleaned, a dirty rucksack that isn’t machine washable or some shoes that have been on one too many adventures to be left any longer, this product is ideal for you. You might ask why you can’t simply hand wash these items, well you can but we really wouldn’t recommend it as immersing them in regular laundry detergents or washing up liquid might inhibit your gear’s technical features. 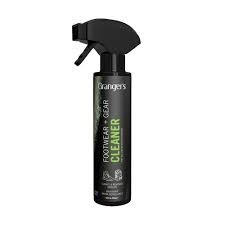 This cleaner is specifically formulated to gently remove dirt, grime and odours from specialist materials and won’t damage any existing water-repellency. It’s also great for preparing footwear for fresh waterproofing treatments and this is why you’ll find it paired with our Footwear Repel in our handy Footwear Care Kit.